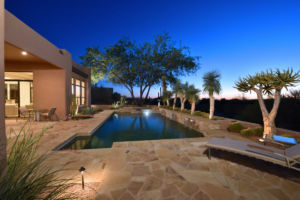 Splendid sunsets and breathtaking views highlight this Southwest Contemporary home on the 6th hole of the Monument course. This meticulously well-cared-for, four-bedroom, three-bath home with an office and a bonus room has clean, straight architectural lines throughout, coffered and wood-paneled ceilings and a statement-making contemporary fireplace to set the tone for this fine property. The kitchen offers slab-granite counters, custom cabinetry with glass inserts, an oversized Sub-Zero fridge, Dacor double ovens, gas range, walk-in butler’s pantry, and a large center island with bar seating. The home office has a separate entrance to the front courtyard set with hand-laid pavers, while the extended-length, three-car garage boasts epoxy flooring and attached cabinets. 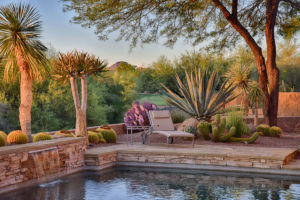 The backyard’s wide-open feel allows for the ultimate in entertaining, featuring a heated pool and spa, stacked-stone water feature, unique desert landscaping, large covered patio, built-in BBQ, and beautiful native flagstone decking. Click here for more information, photos and a virtual tour!